It is perhaps the most recognizable symbol in all the world. Revered by some, eschewed by others, but known by all. 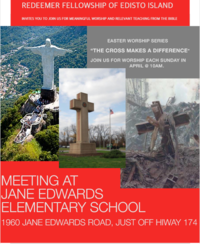 From the hills overlooking Rio de Janeiro, to the twisted metal rising from the ashes of the twin towers, to the 40 foot tall monument honoring our war dead in Bladensburg Maryland, the Cross attracts attention. The question is, has the cross made a difference in your life? Join us for Worship, Sundays, 10am at Jane Edwards Elementary School as we explore the difference the Cross can make in your life. Join us in April as we look closely at how the Cross makes a difference in people’s lives today. We will look at three individuals who each had a ring side seat to the people and events of the original Easter moments. Come worship with us and discover how those first Easter moments can impact your life here and now. Come see how the Cross can make a difference in you. Join us for Worship, Sundays, 10am at Jane Edwards Elementary School as we explore the difference the Cross can make in your life. Troubled by the changes going on around you? Caught in the crossfire of the often divisive debates going on in our communities? Wondering where the time has gone and searching for help in finishing well? Jesus, the man on the Cross speaks to us, speaks to our sometimes harried and harassed lives, about the difference His Cross can make in our lives. Join us for Worship, Sundays, 10am at Jane Edwards Elementary School as we explore the difference the Cross can make in your life.